Let's play a game! It's called: Coachella Indie Band or Slang From Urban Dictionary/Deck Around? Coachella is a big music festival out here on the West Coast for two weekends in the desert and it starts this week. Everyone out here in California gets really excited about it. I like music and I go to concerts sometimes... but I honestly don't know most of the acts at Coachella 2014. And the fact that most folks buy tickets in advance of Coachella announcing the lineup puzzles me even more. How could you know the festival is worth spending your money on? I guess it shouldn't make much difference for me -- because whether they announce them or not, I don't know half the bands on there. In fact... some of these sound a little dirty. Could they be strange slang words from around the web and Urban Dictionary? Unless you memorized the Coachella lineup, I think you'd be hard-pressed to identify the difference. So that's why I made this fun game all done-up to look like the Coachella lineup poster. Guess which are dirty slang words and which are obscure indie bands at Coachella. Three of them are actually both! 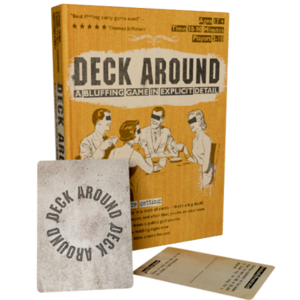 If you head over to the Facebook page and become the first person to get them all right, I'll send you a free copy of Deck Around!